Langston Hughes wrote a poem entitled, “I, Too” in which he dreamed of a day when African Americans would not be shunned. This simple poem speaks volumes about the human person and the struggle to attain equality. Corrie Ten Boom wrote a book entitled, “The Hiding Place” in which she talked about her days in a concentration camp. She was not Jewish; she was imprisoned and tortured for hiding Jews in her home because she believed they were equal human persons. Rosa Parks sat down and refused to get up a seat she was told she had no right to sit in. She decided that she was no longer going to be told that she was less human than anyone else on that bus. Anne Frank wrote in her diary, “I don’t think of all the misery but of the beauty that still remains” – this coming from a young woman having to live in a hidden apartment for two years because she was declared a non – human person. Martin Luther King, Jr. cried out, “I have a dream.” He believed in a world where men were not looked at as black or white, but as men. He believed we could live as equal human persons and destroy the prejudices that plagued mankind. Some may say oppression. Oppression is certainly a word that can be used to describe all of their lives. Can you imagine yourself as a young girl like Anne Frank living in a small hidden apartment for two years, never allowed to leave for fear of certain death? Some may say determination. Langston Hughes was determined to see a day when our African American brothers would not be seen as less than any other American. Some may say courage. I can’t imagine the courage it took for Corrie Ten Boom to risk her own life and freedom for total strangers. She endured years of torture and even found a way to thank God for her bunk being infested with fleas, knowing it saved her from abuse. Some may say resolve. Oh, to see the resolve in the face of Rosa Parks on the bus that day! It would be amazing to see her claim her spot as an equal human person and refuse to be dehumanized. Some may say passion. Passion is one of the best words you can use to describe Dr Martin Luther King, Jr. When you hear his speech you can’t help but be moved. While all of these words are truly things these great humans had in common, there is one other thing that makes them stand out from others who have been dehumanized: their voice. They all had a voice and were able to use that voice to cry out for their lives, their freedom and their humanity. A voice is something that thousands of innocent people every day in America will never have. Can you imagine if a child in the womb could write a poem about how one day he too would be called an American? Can you imagine if babies that were not going to be killed by abortion could hide others that were scheduled for death? Can you imagine if when the abortionist tried to kill a young little girl she was able to sit down in the womb with resolve and say, “I will not be killed”? Can you imagine the speech a young child would give proclaiming the day all innocent pre-born children are counted as human? While we know these things are impossible for the children in the womb to accomplish, they are not impossible for us. We do have a voice; we now need to find the courage, determination, resolve and passion to fight against the oppression of innocent children. 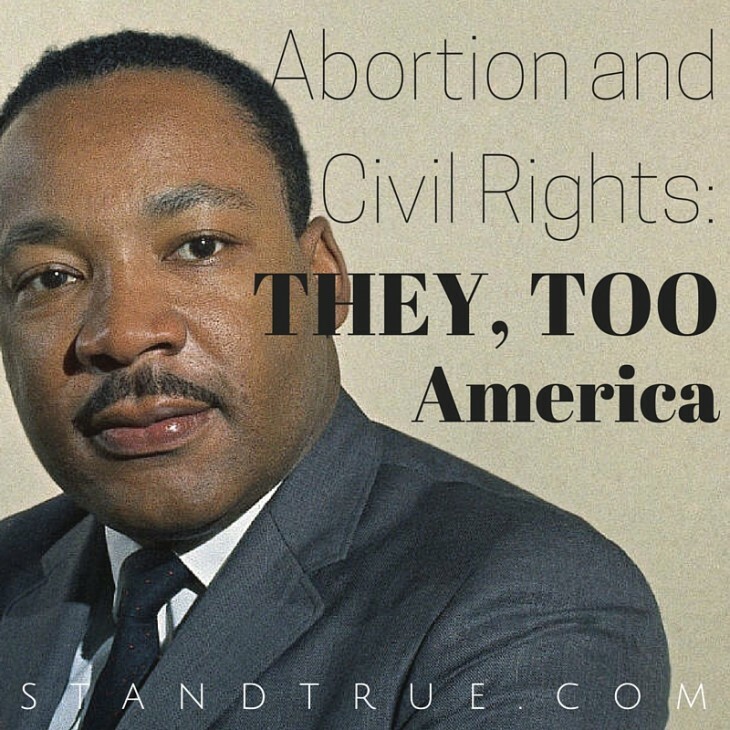 Some may say, “How dare you compare abortion with the holocaust or oppression of African Americans!” I say how dare we not. How dare we look back at some of the most brutal, inhumane and dehumanizing acts in history and not also include the killing of innocent babies? Several years ago ushered in a new era in America. With the election of Barack Obama to the Presidency, we saw something many people believed would not happen in their lifetime. We witnessed something that we should all be proud of regardless of our political views. America took one more step towards equality and wiping out racial prejudices. So many people do not believe they will see the killing of innocent children stop in their lifetime either. So many people have accepted the abortion holocaust as status quo. I refuse to accept or believe that we cannot defeat this evil. It is time, my friends, to adopt the words that describe these great humans I wrote about. It is time to believe that we will usher in an era where pre-born children are considered full human persons. It is time to use our voices to proclaim life and freedom for the thousands of our brothers and sisters who die needlessly every day. We have now lived through 40 years of decriminalized child killing in America, a full generation of the bloodiest genocide in history. It is time to put this hateful chapter in the history books and usher in a culture of life. It is time to say: They, Too, America.